It is an important historical archeological site in Alexandria that is considered to be one of the Seven Wonders of the Middle Ages. Alexandria was called “The Paris of Antiquity” because of its great history and touristic attractions, that you can visit during your Egypt tours packages The Catacombs were part of a Necropolis “the City of the Dead”. They were built on the western edge of the town. Kom el Shoqafa began as a tomb for a single, wealthy family, but was expanded into a larger burial site for unknown reasons. Kom El-Shoqafa means “Mound of Shards”, a name which comes from heaps of broken pottery in the area. According to the historical records, a man called Monseir El-Sayed Aly Gibara informed the local Museum of the location of Kom El-Shokafa in 1900. This site resembles the largest burial destination that dates back to the Greco-Roman period. Alexandria was a great cultural city until 31 B.C when the Romans came and established their own cultural prominence leaving Alexandria in a great cultural mixture. 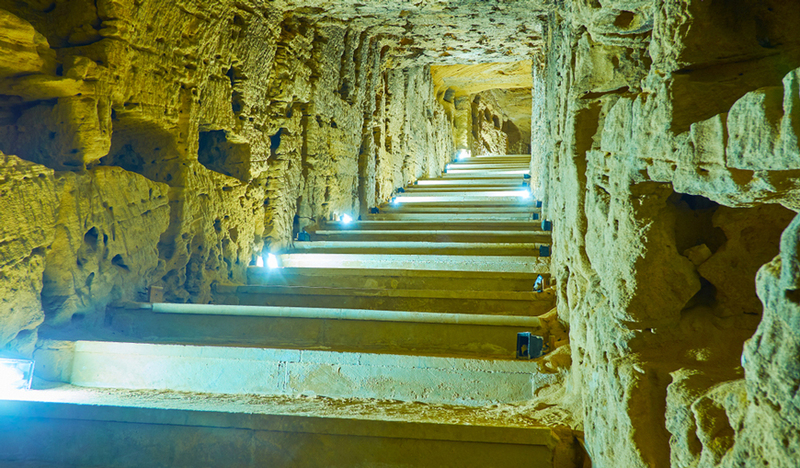 The magnificent Kom El-Shokafa Catacombs are deemed to be the most striking remnant of ancient Alexandria as it depicts the ancient Egyptian, Greek, and Roman cultural mixture. These catacombs were actually built as a tomb for only one family but it was extended to be a bigger burial site. They consist of three levels of solid rock and the third level now is completely underwater. Inside, there is a six-pillared central shaft, which opens off the vestibule. There is a shaft descending underground, which may have enabled the process of lowering the bodies inside the tomb. There is a triclinium on the left side of the tomb, which is a funeral banquet hall. In that location friends and family used to gather on stone couches covered with cushions. There are two pillars in the lobby of the second level. They are crowned by the papyrus, lotus, acanthus leaves of great ancient Egypt. Moreover, there are two falcons flanking a winged sun decorate the frieze. There are some figures of a man and a woman carved on the walls of the tomb. There is a hallway that has walls with a depth of 91 in the central tomb chamber and each chamber provides a burial space for three mummies. Rotunda wall is so important for tourists to go through a breach to reach the first level. It leads to the Hall of Caracalla in which the bones of horses and humans were found. The main tomb of the catacomb dates back to the 1st and 2nd centuries A.D when the Roman emperors Domitian and Trajan ruled over Egypt as well as a large section of the expanding Roman Empire at this period of time. The statues in this section were modified to suit the Greco-Roman style in its decorations. The characteristics of the ancient Egyptian style just like the two crowns of Upper and Lower Egypt and the sun disk of the god Horus was mixed with the Greco-Roman symbols like the thyrsus of the Dionysian cult. Above the two pillars on the second floor, there are scenes of the sun god Horus, who based on the ancient Egyptian belief, was protecting the tomb from any threats. The figure on the right of the tomb for a man and a woman on the left may represent a couple. There is a burial chamber with a central sarcophagus and two other sarcophagi with the central part of the second floor, which is likely belonged to a 2nd-century Roman woman in Egypt. Inside the door of the tomb, there is another figure “The God Anibus”, who is closely associated with the burial traditions in ancient Egypt. • It was the main burial site from the 2nd to the 4th centuries A.D.
• When you enter the catacombs, you will find a circular staircase that takes you to a unique room where you will witness the real beautiful mix of the Roman and the Egyptian art. • There is a room on the first floor called, the Hall of Caracalla, which contains human and horses bones. • Three sarcophagi have been found inside the catacombs, which are big stone coffins. • It reaches about 100 feet down into the ground. • There were a lot of other catacombs found in the area but they weren’t in a good shape just like the catacombs of Kom El-Shoqafa. • A donkey lost its footing On September 28, 1900, and discovered the access to the catacombs, which excavators tried to discover from 1892.